A pop of yellow on this cloudy day! I got this skirt a while ago looking to add some color ( aside from pink) into my wardrobe and I could not have chosen better! The yellow hue is enough to brighten anyone’s day. Come on, guys, to me it just screams summer. In fact, it’s impossible to not be happy while wearing it even though on a cloudy day. I usually have a tough time finding mini skirts that look proportional on my tiny frame, but this one is short enough to be sassy without being “flash-y”. A perfect little piece to pair with my go to cropped long sleeve sweater from Lyst and over-the-knee-boots and makes it one of my favorite combos this season. 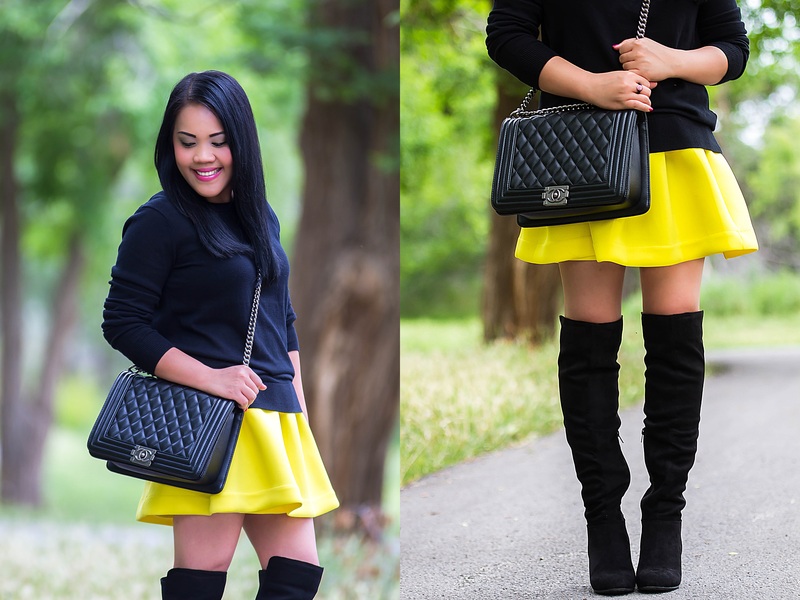 All in all, I’d definitely recommend this skirt for anyone looking to add a pop of yellow into her wardrobe! Previous Post Kindergarten here we come! Next Post It’s cooling up here! I can do all things through Christ[a] who strengthens me. Like Mother of coarse haha!! Gorgeous! You hit the nail on the head! I love the color too!